Jack White, who just put a new “vault package” up for sale, will release new 7″s by Tom Jones and Duane The Teenage Weirdo on his Third Man imprint this year. End-of-2011 releases included John C. Reily and Jerry Lee Lewis. 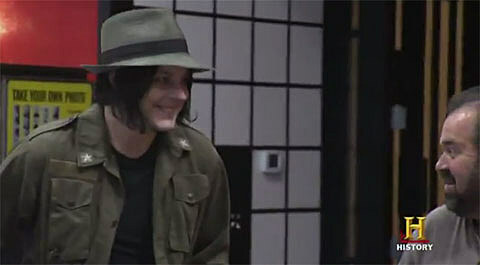 Jack White welcomes the crew from The History Channel’s American Pickers for a rare visit to his Nashville-based Third Man Records this Monday, January 9th at 9 pm / 8pm Central (Check local listings). Jack drives a hard bargain with the American Pickers guys, offering personal artifacts including the actual photo booth used in The Dead Weather “Hang You From The Heavens” video in exchange for one of the most “memorable” treasures ever to appear on the show. Set your DVRs. Watch the TV commercial, and a new video featuring Jack White from the Danger Mouse-Daniele Luppi album Rome, below. Catch Third Man group The Black Belles on tour and in NYC in February.